There are several unusual things about this houseplant. First, its unusual growth habit as it matures is sure to attract attention. On mature plants, new leaves sprout directly from the center of large, mature leaves at the point where the stem attaches to the leaf. This strange habit has earned the nickname "piggy-back plant," "youth-on-age" and "thousand mother" plant (not to be confused with the kalanchoe of the same nickname). Aside from this unusual habit, the Tolmiea is also notable for its lush foliage and the fact that it's from North America, which is not exactly a hotbed of houseplants. In fact, these plants naturally grow among the redwoods of the Pacific coast in the northwestern United States. Light: Bright, indirect light. It will grow with some direct morning sunlight, but prefers dappled light. It will grow in light shade. Water: Keep soil constantly moist all year and mist occasionally in very dry environments. Tolmiea likes high humidity, but dislikes intense heat and dry air. Temperature: Think pine forests, with days in the mid-70s˚F and stable down to 50˚F. Soil: A loose, well-drained potting mix. Fertilizer: Fertilize during the growing season with liquid fertilizer or controlled-release fertilizer according to label instructions. Tolmiea are extremely easy to propagate, given their growth habit. Take leaf cuttings consisting of a single mature leaf with its fleshy stem intact. Place the stem into seed-starting soil and keep it moist and warm until new growth begins to emerge. Tolmiea are not typically long-lived indoors, so it's a good idea to take new cuttings annually, at the beginning of the growth season, so you always have a mature plant on hand. Tolmiea grows in a spreading mound of hairy, large leaves, with new leaves emerging from the center of mature leaves. When it comes to repotting, spring is the best time. Place the adult plant in a new, slightly larger pot, with fresh soil. This is also the best time to take leaf cuttings. After two years or so, the adult plant will be nearing the end of its viability, so shift your attention to the smaller plants and set the older one outside in your garden or on your patio for the season. The Tolmiea plant is the only member of its genus (fittingly Tolmiea). In its native habitat, the plant is a perennial that constantly regenerates from the new plantlets it produces. The plant is native to the Pacific Northwest. If it does flower, the flowers are small and white and arise on a small spike. Because its flowers are less than exciting, it's generally grown as a foliage plant. 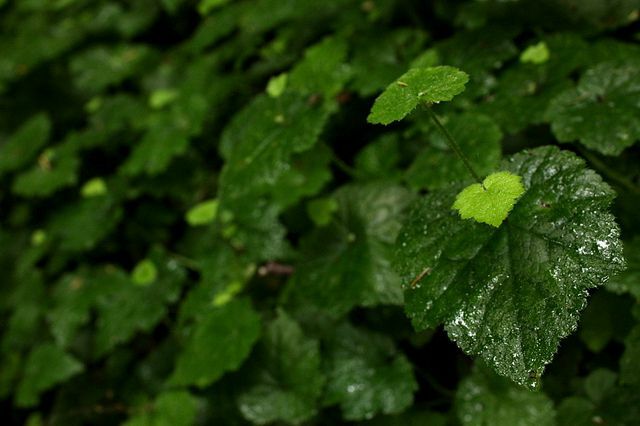 Tolmiea is a very useful plant for cool, humid rooms with decent light. These are tough conditions to match with many houseplants, but as a rule of thumb, Tolmiea will thrive in the same conditions that temperate ferns enjoy. The plant will quickly brown and die if exposed to intense dry heat, and direct sunlight can also be deadly. Tolmiea is also an excellent hanging plant in baskets. Over time, the plant will adopt a drooping posture, with its vibrant green leaves falling in a bright cascade. Leggy, loose plants usually signify a lack of light. In these situations, try to increase the amount of light the plant gets. Tolmiea’s fleshy leaves are attractive to spider mites and aphids, so be on the lookout for the tell-tale webs on the undersides of leaves for spider mites or tiny green aphids on your plants. Lastly, even under the best conditions, don't expect your Tolmiea to live beyond about two years. Propagate older plants annually to keep a supply of Tolmiea.